Type 1 diabetes mellitus (T1DM) commonly occurs in childhood or adolescence, although the rising prevalence of type 2 diabetes mellitus (T2DM) in these age groups is now being seen worldwide. Diabetic nephropathy (DN) develops in 15–20% of subjects with T1DM and in similar or higher percentage of T2DM patients, causing increased morbidity and premature mortality. 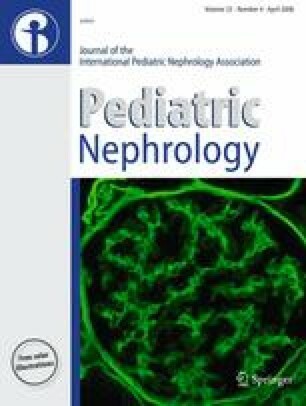 Although overt DN or kidney failure caused by either type of diabetes are very uncommon during childhood or adolescence, diabetic kidney disease in susceptible patients almost certainly begins soon after disease onset and may accelerate during adolescence, leading to microalbuminuria or incipient DN. Therefore, all diabetics warrant ongoing assessment of kidney function and screening for the earliest manifestations of renal injury. Pediatric health care professionals ought to understand about risk factors, strategy for prevention, method for screening, and treatment of early DN. This review considers each form of diabetes separately, including natural history, risk factors for development, screening for early manifestations, and strategy recommended for prevention and treatment of DN in children and adolescents. This review is based on the lectures presented at the 2nd Meeting of the Southeastern Europe Pediatric Nephrology Working Group (SEPNWG), 7–9 April 2006, Belgrade, and at the 18th Danube Symposium of Nephrology, 26–28 September 2006, Novi Sad (Serbia). The review appeared in abstract form (Kidney Blood Press Res 2006; 29:195). The work is supported by the Ministry of Science and Environmental Protection, Government of Serbia, Grant No 145046D. The author is indebted to Professor O. Mehls for critical reading and to Mrs. B. Krsmanovic for invaluable help in preparing the manuscript.